What a difference three years can make. Skip back to TVRG's last Sitcom Scorecard from 1974-75, and how the dynamics have changed. 1977-78 has 15 more players than '74-'75, which sets TVRG's current record low of 23 sitcoms offered in a season. The fortunes shined on ABC, as they turned the top of the table green with landmark hits bringing the element of "fun" back to the definition of sitcom. The genre's mid-70's helping of CBS relevance delivered downers and heavy material, while ABC's fantasy-laden fares returned laughs to simpler problems such as forgotten anniversaries and ruining a roommate's dress right before her big date. Indeed, preferences had changed as viewers wanted to experience forgetting the ugliness of everyday life for 30 minutes and be able to laugh at the ridiculousness of something like Soap. Up until Summer 2017, complete listings of ratings were not available on the internet for years before 1995, and now this site possesses ratings for several years dating back to 1964. Enjoy the latest entry, as complete 1978-79 and partial 1981-82 data is planned next for sitcom scorecards. ABC was the 1st place champion in the overall ratings for the 1977-78 season, and they possessed a slew of winning sitcoms to accent their victory. 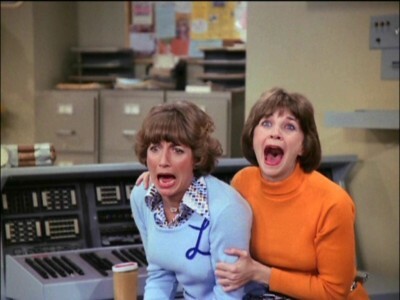 After wisely retooling Happy Days in 1975, ABC managed to strike lightning twice and crafted spinoff Laverne and Shirley, which became the landmark sitcom of the late 70's. In a disco-laden time period which cocaine was on the rise, viewers enjoyed a simpler departure in a nostalgic high from the late 50's as these shows depicted. Of course, nostalgia was not ABC's lone vice of choice. Pushing the envelope of sexuality gave the network cheap fantasy thrills via Three's Company and their latest controversial Soap, which several affiliates refused to air because of the "suggestive" pilot. Ha! If only these opponents could flash forward 40 years and see the ladies of 2 Broke Girls regularly referencing their lady parts as though they are a character on the show. Elsewhere, Barney Miller, Welcome Back Kotter and What's Happening delivered traditional helpings of sitcom delight. Over at CBS, it was time to retool the issue-laden sitcoms as the network cancelled 11 of their 18 helpings. All in the Family was still a top-10 player, yet suffered the loss of Sally Struthers and Rob Reiner, leaving the future of the tart sitcom up in the air. Alice, MASH and One Day at a Time delivered nicely, but renewed Rhoda, The Jeffersons and Good Times all struggled with middling ratings. The upstanding Newhart and issue-icky Maude met less than honorable endings after 6 seasons, and none of the 9 pilots offered this season survived. Over at NBC, Sanford Arms, a spinoff of uber-successful Sanford and Son, delivered ratings near the drain. After Freddie Prinze, Sr.'s suicide in early 1977, Chico and the Man was never the same and NBC cancelled the series after 4 seasons. Not a single NBC sitcom survived the season, as the network was in its longest depression to date, having started in 1974 and not subsiding until early 1984.